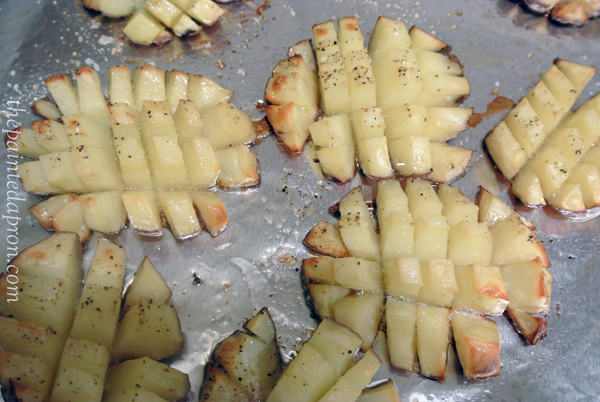 Cut red potatoes in half and score deeply, making squares, being careful not to cut all the way through. 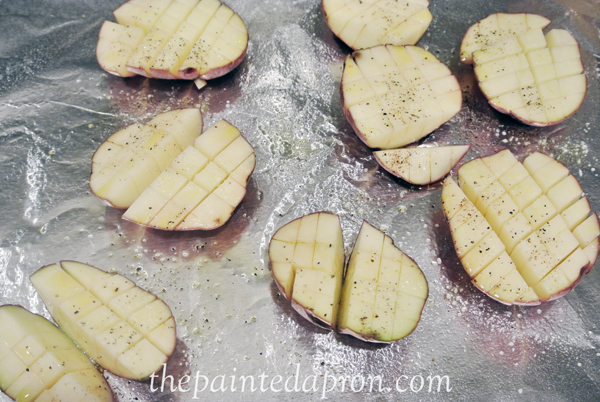 Place potatoes cut side up on a foil lined pan. Separate cuts gently with your fingers to help potatoes open up during cooking. Drizzle with olive oil or spray with olive oil spray and season well with kosher salt and pepper. and you will be so glad you made these! and a super appetizer for a Super Bowl party! 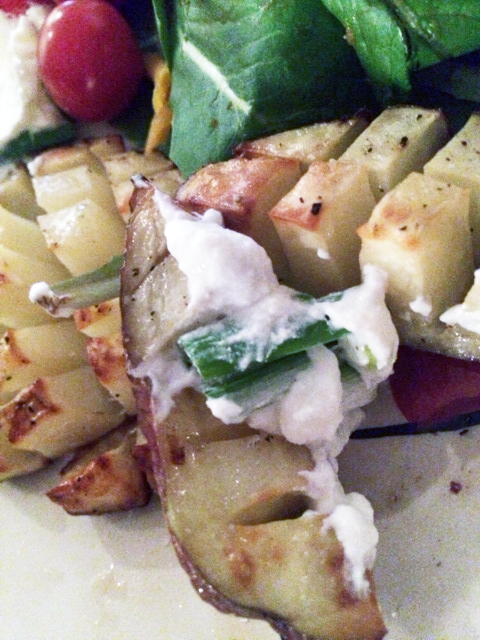 Using olive oil makes these baked fries a great healthier choice. You may never want a boring old french fry again after tasting these! Wash potatoes and cut in half. Cut each half into squares or diamonds, making deep cuts about 1/4″ apart and being careful not to cut all the way through. 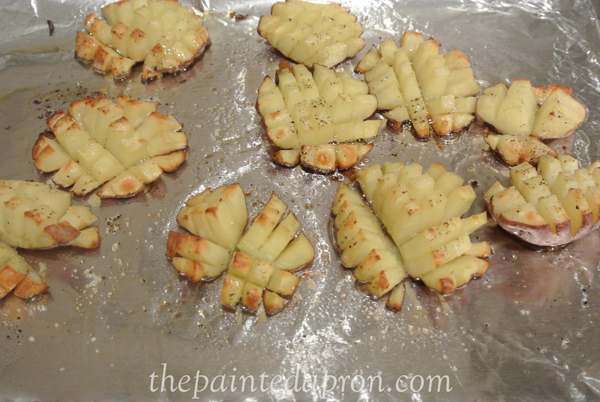 Place potatoes cut side up on a cooking oil sprayed foil lined baking sheet. 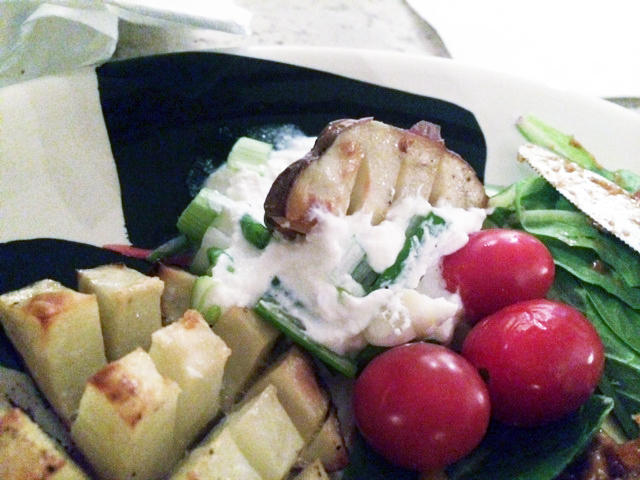 Drizzle potatoes with olive oil and use your fingers to help coat all the cut edges. Season liberally with salt and pepper. Roast at 425 for about 40 minutes or until nicely browned edges appear. 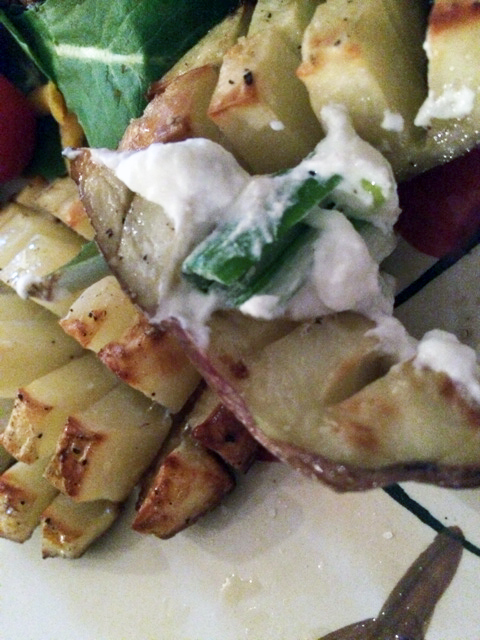 Serve warm with sour cream and onions for dipping. 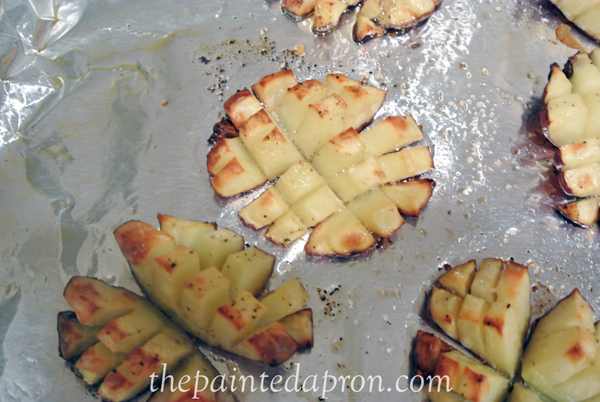 NOTE: to make these a little more appetizer friendly, cut the potato halves in half again, down the middle, after scoring, and you will have more like a wedge shape that is easier to eat as finger food. Nice recipe, but oh so fattening. Have a great weekend! It’s really not too bad Liz, use olive oil cooking spray and just a tiny drizzle of oil, and 1 little ole T of light sour cream is just enough to make you feel sinful without being so! 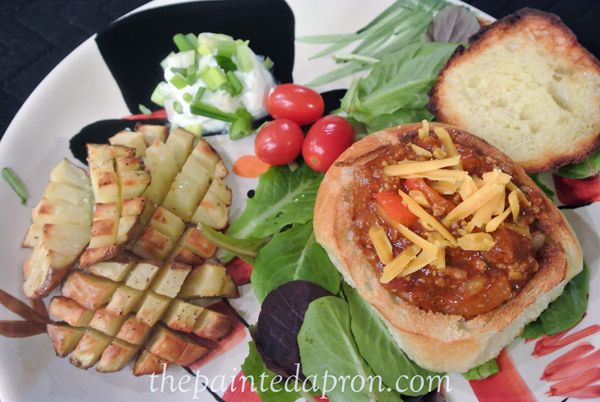 This sounds perfect for a yummy appetizer, side dish or main dish with a scoop of chili. We need to try these out. I like that they are baked too – helps with plans to take off holiday and vacation pounds! 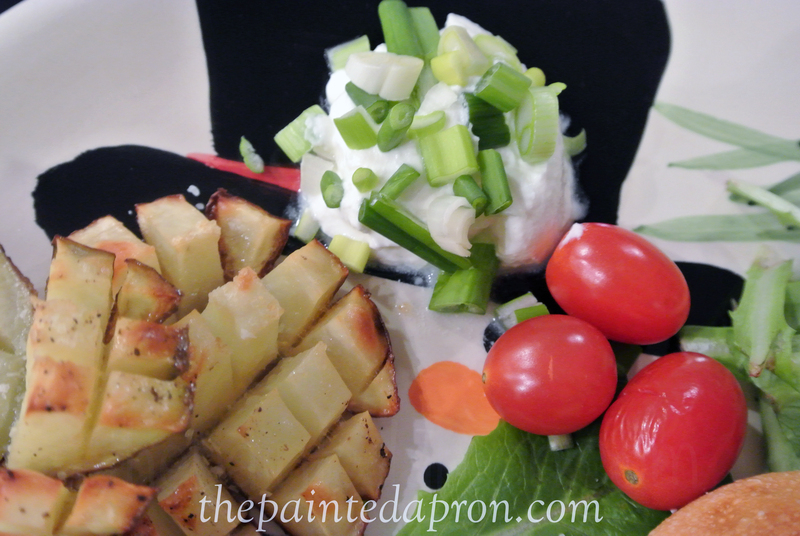 Your Baked Waffle Fries with Sour Cream and Onion look fabulous, I can almost taste these potatoes. What a special recipe for a special event. Thanks for helping us celebrate Three Years at Full Plate Thursday. Hope you have a great week and come back soon!